Creator: Kansas City Slide Co. These two glass lantern slides are advertising products sold by Solt Lumber & Coal Company in Barnes, Kansas. In this letter to Franklin G. Adams, Albert R. Greene explains that he recently met with Charles C. Haynes, with whom he discussed the waning days of the Overland Stage. Greene explains that Haynes was old but that his eye was as "keen as when he ran the gauntlet of hostile Indians and brought his coach into the home station bristling with arrows." This Greenleaf, Kansas, fair poster features two girls holding a hand fan. This is a view of the band shell located in the I.O.O.F. (International Order of Odd Fellows) Park in Barnes, Kansas. Small, oval-shaped gold brooch. Engraved black enamel tracery design at center. Stippled texture in gold around design; gold in the design is smooth. Bar closure on back with a "t" hinge and "c" clasp. Brooch belonged to Sophia Brockmeyer Hollenberg Kalhoefer. 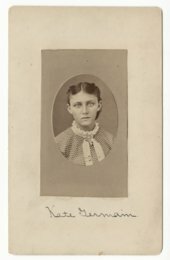 Her first husband was Garet Henry Hollenberg, who operated Hollenberg Station at Hanover, Kansas. These eight buttons were recovered from the 1991 Kansas Archeology Training Program at the Hollenberg Pony Express Station, in Washington County, the location of a pony express station, a post office, a blacksmith shop, and a farm with barns and other out buildings. The site, also a stop on the Oregon-California trail, was purchased by the Kansas Legislature in 1941 and is on the National Register of Historic Places. Shown are a broken shell button, a 4-hole button with a purple cast, a clear glass button with an eight-pointed star pattern, a white china dish button with maroon trim, three white china dish buttons, and a black china 2-hole button with traces of gold around the sew-through holes. Two views of the caretaker's cottage at the Pony Express Station in Washington County, Kansas. The station, originally a ranch house, was built in 1857 by Gerat H. and Sophia Hollenberg, for people traveling on the Oregon-California Trail, and from 1860 to 1861 it was operated as a Pony Express station. After Gerat Hollenberg's death in 1874, the station became a farm home until 1941 when the Kansas Legislature purchased the building and the surrounding seven acres. The site was listed in the National Register of Historic Places in 1961 and two years later, the Kansas Historical Society was given the responsibility to operate it as Hollenberg Pony Express Station Historic Site. This abrader was recovered from the Wollenberg village in Washington County in 1991. Archeologists call abraders groundstone tools as they are shaped by grinding. This sandstone abrader has been used to sharpen another tool, such as a bone needle or awl. These three abraders were recovered from the Wollenberg village in Washington County in 1991. Archeologists call these groundstone tools as they are shaped by grinding. The sandstone abraders could be used as pairs, one on each side, to smooth a wood shaft. Four photographs showing a ceremony at the Hollenberg Pony Express Station marking the location as a registered National Historic Landmark. The three men pictured by the monument are S. Sohl, M. Mattes, and L. Dieker. The Hollenberg ranch house was built in 1857 by Gerat H. and Sophia Hollenberg, establishing a way station for travelers on the Oregon-California Trail, and from 1860 to 1861 they operated a Pony Express station. After Gerat Hollenberg's death in 1874, the station became a farm home until 1941 when the Kansas Legislature purchased the building and the surrounding seven acres. The site was listed in the National Register of Historic Places in 1961 and two years later, the Kansas Historical Society was given the responsibility to operate it as Hollenberg Pony Express Station Historic Site. This black and white postcard shows the Charlie Thompson family sitting in an automobile in Linn, Kansas. The family has been identified as follows: FRONT ROW : Charlie, sons; Arnold, and Chester. BACK ROW: Iona, the wife and daughter Gertrude. This photograph shows inmates D. W. Stahl, prisoner #9548 and John Armstrong, prisoner #8762. D.W. Stahl was received at the Kansas State Penitentiary on November 23, 1900 from Washington County, Kansas for larceny. Inmate John Armstrong was received at the penitentiary on December 18, 1898 from Oklahoma for perjury. Several photographs of the dedication ceremony for the Pony Express monument in Washington County, Kansas. Waddell F. Smith and Leo Dieker help with the unveiling of the monument. In 1857, Gerat H. and Sophia Hollenberg established a way station for travelers on the Oregon-California Trail, and from 1860 to 1861 they operated a Pony Express station. The Hollenberg Pony Express Station was added to the National Register of Historic Places in 1966, and earlier as a National Historic Landmark in 1961. This whiteware plate sherd was recovered from the Hollenberg Pony Express Station in Washington County in 1991. It was found below the station and may have been lost anytime during the buildings use as a home or station. The sherd shows the maker's mark of the W. & E. Corn pottery of England. The Hollenberg Pony Express Station was added to the National Register of Historic places in 1966, and ealier as a National Historic Landmark in 1961. This is a view of the stone barn and Eddy family members with horses, on the Eddy farm in Washington County, Kansas. A farm implement is visible on the hill in the background. This is a view of a large flock of sheep in front of a barn on the Eddy farm in Washington County, Kansas. An unidentifed man is shown supporting a sheep that is standing on its two hind legs. Around 1919, the Kansas State Historical Society and the American Legion solicited biographical information from returning veterans (primarily members of the 35th and 89th infantry divisions) and the families of those who died in service, notably from the Gold Star Mothers. Each veteran or family member was asked to provide letters, photographs, a biography, and military records. This file contains information on Edward David Wells, Headquarters Company, 168th Infantry, 42nd Division. Wells was killed in action on September 12, 1918. This publication is from the Central Branch, Union Pacific Railroad Company. It promotes land sales targeting recent emigrants interested in purchasing agricultural land in central and eastern Kansas. Shown are views of the excavations at the Wollenberg site during the 1991 Kansas Archeology Training Program field school. The slides show Kansas Anthropological Association volunteers and Kansas Historical Society staff, an excavation of a post, an exposed artifact complex and a progress shot. The Wollenberg site was a village site in Washington County occupied during the Middle Ceramic period.